Why Employ an Orthopaedic Fellowship Personal Statement Writing Service? Competition for places in orthopaedic fellowship programs is strong. Just over 700 places are available in North America, and even smaller numbers are accepted in sub fields such as spine surgery or oncology. Hence your residency application personal statement when making an application is crucial, it should make you stand out from others and ensure you are invited for the interview. It must read well, contain no grammatical errors, explain why orthopaedics is your desired specialty, and promote you perfectly as an outstanding candidate. To meet these needs many people will choose our fellowship writing service. Our writers are experienced in applications for fellowships in orthopaedics. They know this specialty requires a particular set of skills, including surgery, and work with you directly to ensure your statement shows that you have them, and that you want to work in orthopaedics and plan a career in this field. With help from an orthopaedic fellowship personal statement sample you supply the information you want to be included, then we write your own original personal statement. 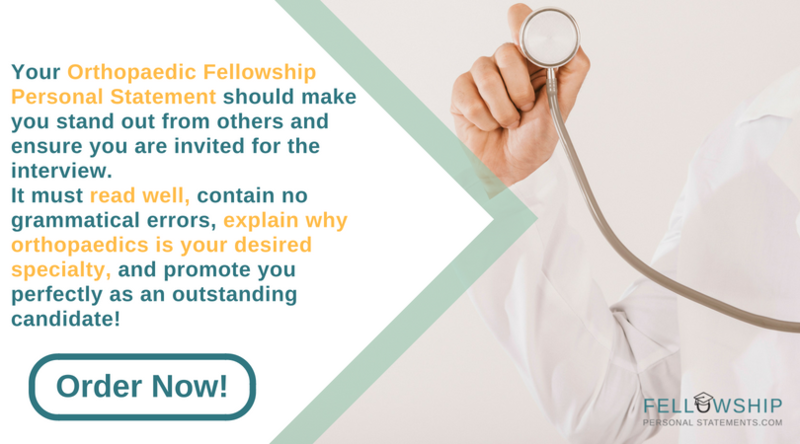 Why you want a fellowship in orthopaedics? The board must be convinced of your desire to specialize in this field or a particular sub field such as hand or shoulder surgery. How you intend to progress in the future? Whether as an orthopaedic surgeon or doing clinical research, you should indicate your career plans. An orthopaedic fellowship requires general medical practice in addition to specialty studies. Your statement should reflect your training in general medicine but make skills which are applicable to orthopaedics, such as surgery, more visible. You may have personal reasons to apply for a fellowship in a particular location, or perhaps the school works on research topics which interest you. Showing you are keen to work and study with the staff in question will encourage them to interview you further. Why Choose Us to Write Your Orthopaedic Fellowship Personal Statement? Your assigned writer will be familiar with writing personal statements for an orthopaedic fellowship or requirements for a rheumatology fellowship personal statement if needed. All our writers are native English speakers, educated to post graduate level in subjects relevant to your application, and know how to present your personal details and ambitions in an original and engaging document. “During my junior year in high school I suffered a knee injury playing football. Although rehabilitation went well and I was able to participate in many sports for personal pleasure, I was no longer able to play football at the necessary level. It was not a particularly devastating event. I was an average player and wouldn’t have played at the college level even if I hadn’t been injured. In some ways, it was a misfortune that turned out to be fortunate. I developed an interest in orthopedic surgery, and my grades, which were always pretty good, were even better during my senior year, without the distraction of football. Good enough to get a partial scholarship to college which eventually would lead to attending medical school. Once accepted to medical school, I never doubted that I would eventually end up in orthopedic surgery. I was able to get into a residency program for orthopedic surgery enjoyed the experience more than I had hoped. The work I do is satisfying and gives me a sense of accomplishment I had not expected to feel. It has also given me a thirst to learn more and I would like to continue my education by completing an orthopedic sports fellowship program. What Guarantees Do Your Orthopaedic Fellowship Personal Statement Writing Service Have? To ensure you are satisfied with our writing service we follow certain procedures. Your first personal statement will be delivered by the deadline which you set. It is always proofread and guaranteed to be original. Any hint of plagiarism will jeopardize your application. Copying is a recognized problem in education and accordingly, we only issue unique personal statements. Our service then allows you to make unlimited revisions until you are happy with the content. Any time you become unhappy with our service, we guarantee your money back. For an improved chance of acceptance get our experts to write your orthopaedic fellowship personal statement here today!